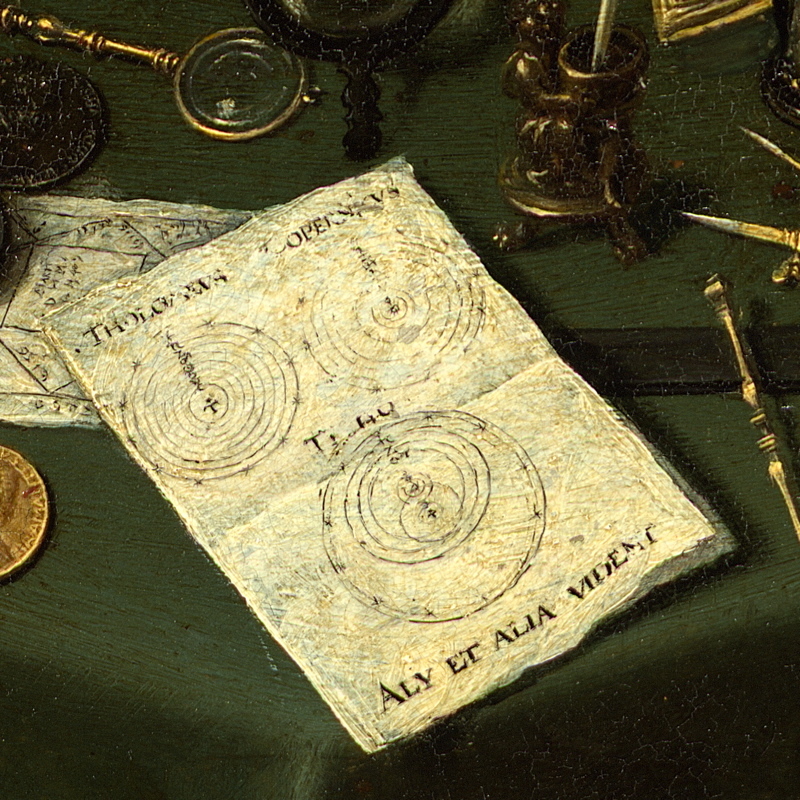 At the front of the green octagonal table in the Linder Gallery, very prominently positioned in the painting, is a scrap of paper bearing three competing systems of the universe: the Ptolemaic earth-centred system at the top left, the sun-centred Copernican system (prohibited by the Inquisition since 1616) and the compromise system of the Danish astronomer, Kepler’s mentor Tycho Brahe, which has the inner planets going around the sun but the sun and the outer planets orbiting around the earth. At the base of this piece of paper in tiny but very precise writing are the Latin words “ALY ET ALIA VIDENT” meaning “Others see it yet otherwise”, suggesting that the three systems presented here are not exhaustive. Could this be a reference to Johannes Kepler who proposed that the planets orbit the sun in elliptical paths, did not believe Tycho’s system was physically plausible and abandoned Copernicus’s solid crystalline spheres? Behind the diagram of the cosmic systems is an astrological geniture for an as yet unidentified person born in the month of March. Perhaps the artist is suggesting the extremely close link between astronomy and astrology in the seventeenth century — Tycho Brahe and Kepler both earned income from casting horoscopes. It is interesting that ALY ET ALIA VIDENT is such a central phrase to the painting, almost like a caption — Others see it yet otherwise — the universe is amenable to different forms of interpretation. This is a strikingly casual stance for the period just a few years prior to Galileo’s Inquisition trial for Copernicanism. References to Galileo’s telescopic discoveries, incidentally, are surprisingly absent from the Linder Gallery, here we seem to be much more in the realm of precision measurement. ALY ET ALIA VIDENT. What is behind this intriguing phrase? Could it be an oblique reference to Kepler? Or is it just a lack of cosmic committment? Given its prominence in the painting, could it be a suggestion that the painting itself is open to radically different forms of interpretation, or is that just a 21st century way of reading too much into a scrap of painted paper? 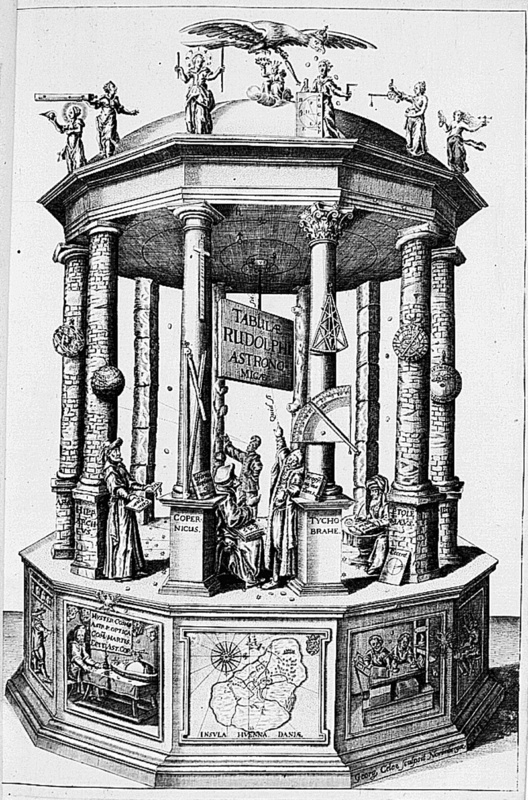 Again, this drawing seems to relate to the frontispiece of Kepler’s Rudolphine Tables, the book present on the green table, where we behold the Temple of Urania, muse of astronomy, inhabited by great astronomers of the past. Tycho Brahe points at the ceiling which is marked with his own cosmic system, asking the words “Quid si sic?” — “What if it is like that?”. Kepler himself is not included in the temple but sits in the base, looking at an architect’s model as the “humble” architect of a new edifice of astronomy. Another puzzle: given that the painting is all about measurement, geometry and perspective and their relationship with the arts, why is the perspective of the octagonal green table itself so wonky, apparently tilting forward? The green table seems more complicated to me. First, I’m not sure we can claim it’s octagonal (there might be just enough edge showing to test this – I don’t see opposite sides meeting in a fixed spot, or opposite sides at all). This sounds weird, but if you take a good look at all the medals lying flat on its surface (supposing its surface is flat, which I’m not), the geometry is all wrong. I realise the astrolabe is resting on another object, but this should tilt it further towards us, not away. More peculiarly, the celestial globe isn’t spherical – its top isn’t above its bottom. I thought at first that perhaps its back leg was resting on a book, but this doesn’t explain the non-sphericity. The Galileian compass seems almost parallel to the viewing plane. I have no idea at the moment what this might mean, only that, if one of the readings is that painting rests on design, the design is either ‘wrong’ or trying to provoke some reaction. Incidentally, regarding N.6 ‘Landscape with figures’ – Unless there’s substantial surface wear here (which doesn’t seem to be the case) why can you see the wood behind? To me, it looks like an unbacked convex mirror / lens, reflecting a bizarre view of the viewer / painter as a hermit or stranger. I’m not sure we should be overly concerned by the dodgy perspective of the (octagonal or otherwise) central table. We’re evidently intended to be able to see clearly all of the objects it bears, so tilting it – even though it distorts the naturalism of the scene – is a sensible, practical solution that serves to emphasize key objects. Re: No. 6 – I think it is definitely a painting (one can make out the landscape quite clearly), but it is certainly odd. The paint is thinner here than elsewhere – as you say, Nick, one can see through to the wall below – so it seems this might have been an afterthought. We’ve wondered in the past whether Linder – in the ‘patron and artist’ portrait – might not be pointing to this very spot on the drawing he holds, so maybe there’s some special significance to this little round picture that eludes us?